Ever since I jumped on the “healthy eating” bandwagon I have been bombarded by all kinds of weird grains and seeds and veggies that (to be honest) I didn’t even know existed. Now buying a package of chia seed or quinoa or flax seed is as easy as a trip to Costco. So what are the differences between Chia Seed and Flax Seed? Which one is “healthier?” Welp….look no further. Are you thinking of a Chia Pet? Yeah…so did I. Actually the first sales of the chia seed were sold on Chia Pets and we would just grow them as house plants. Who knew those little seeds in that clay figurine sheep were so good for you! ORIGIN: The word chia actually stems from the word “chian” which means “oily” The Chia plant is native to Mexico and Guatemala. WHY IS IT GOOD FOR ME: One ounce of chia seed contains 9 grams of (healthy omega-3) fat, 5 milligrams of sodium, 11 grams of fiber and 4 grams of protein. This one ounce can also give you 18% of your recommended daily Calcium, 27% of your phosphorous, and 30% of your manganese. Not to mention, adding chia to your diet has been shown to help boost energy, stabilize blood sugar, aids digestion and support healthy cholesterol. When my dad started having problems with his cholesterol and blood pressure, his doctor suggested he added just one teaspoon of this little seed to his orange juice every morning. After just a few days of taking the seed, my dad saw better test results and now has more energy! ORIGIN: The flax seed (also known as linseed) has been used by humans since 30,000 BC. They would use its fibers to spin fabrics and can be grown in most of the cooler regions of the world. 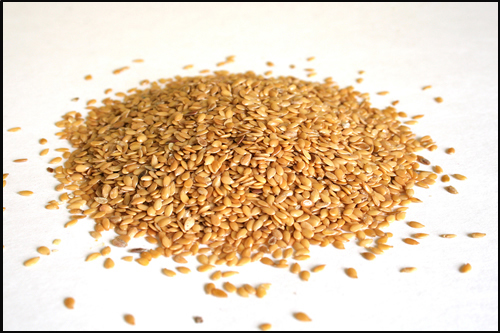 WHY IS IT GOOD FOR ME: The flax seed contains a lot of dietary fiber, omega 3 fatty acids, and a whole crop load of micronutrients. It has been proven to lower cholesterol, reduce the risk of breast and prostate cancer, helps stabelize blood sugar levels (making it especially good for diabetics), and has shown to be full of antioxidants. So now the battle begins – flax seeds vs chia seeds …which is the better seed? Here is a little break down chart for ya! I guess it just all boils down to what you are looking for in your diet! If you have high cholesterol flax seed is your strongest seed, if you have a need for less calories and fat in your diet than chia seed is your man! I’ve heard a lot about these little seeds but I have never used them. Sounds like I’d better get myself in gear. I’ve seen them both at Costco – a sign that they are more and more mainstream! I’ve never used Chia seeds. I’ll get some and try them out. I’ve seen plenty of recipes. I have been using Chia seeds for about a year now. I also use flax seed. I appreciate your side by side comparison; it is very helpful. I plan on continuing using Chia seeds & think I will give up on the flax. Great to know. Thanks for the tips! I use chia straight in things that need to be cooked, but should be soaked in some kind of liquid for awhile, doesn’t take long, even works with water. They absorb a lot of liquid, then they puff up and turn jelly like. It would be better to have that happen in a glass than in your gut. Very nutritious. Hope this helps. Check out Pinterest there are tons of recipes for chia seeds. 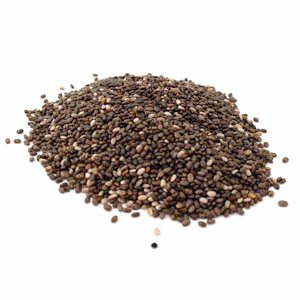 I have been using the flax seeds (crushed) in my morning smoothie but didn’t know much about the chia seeds. Thank you for the information and the comparison! I love both chia seed and flax seed. I put a tablespoon each in overnight oatmeal for a quick breakfast in the morning. Why not eat both? I throw chia in my oatmeal or even cold cereal or yogurt. That’s definitely an option since they both have great health benefits! I am going to start using flaxseed, does anyone know how much I should intake per day? Thanks!